Last month my buddy Jim Chubb talked about the importance of biological filtration, why you’d want to use a biological filtration box, and how to hide a FilterFalls. In this post I’m going to talk about a complementary approach to biological filtration, the Bog Filter. Bog filters are the perfect companion to biological filters, because they help complete the nitrogen cycle that begins with biofilters like the FilterFalls Jim was talking about. Biological filters harbor the bacteria that convert ammonia from fish wastes into nitrates. Bog filters take those nitrates out of the water column and convert them into plant material. The reason this is so important is, the nitrates that result from a well-functioning biofilter are plant food, and if there are no other plants in the system, or even too few plants, those nitrates are going to feed lots and lots of algae. That’s right. The better your biological filtration is, the more plant food is going to be created, and the more algae will grow… UNLESS there are other plants to consume those nitrates. Enter the Bog Filter, the perfect way to get those nitrates out of the pond water, and so, to eliminate green water and string algae. Basically, by placing desired ornamental plants in bare gravel, without sufficient soil to feed themselves, the plants take up all the available nutrients in the water and starve out the undesirable algae. Bog Filtration is a pretty simple concept, so there are plenty of different ways to implement it. The simplest are graveled areas in or adjacent to the pond filled with bog and marginal plantings, called passive bogs because there is no active flow of water through the gravel. Active bogs use the pumping system to force water through the planted beds, and are much more effective because all the nutrients in the pond have to pass through the matted roots of the bog filter, and are removed. There are two kinds of active bogs that differ in the direction of water flow. Downflow Bogs pull water down into the planted gravel bed, while upflow Bogs reverse the flow, pushing water up through the plant roots and out the top of the gravel bed. Because downflow bogs tend to trap sediments and clog more frequently, we’re going to talk about building upflow bogs instead. The advantage to active upflow bogs is that they can be placed just about anywhere. 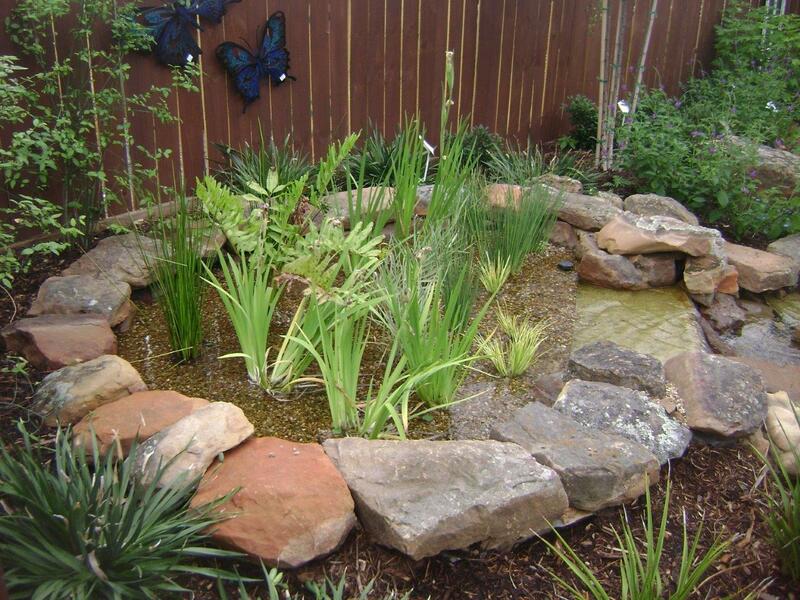 Perimeter bogs, waterfall or stream bogs, even bog islands are simple to add to any existing pond, as long as they are built so the pumped water makes its way back into the pond. One of the most effective bogs I’ve seen was built on an island in the center of an existing koi pond. A plastic grate set on cinder blocks about 6” below water level was covered with a piece of liner, then ringed with dry stacked stones to the surface. A planted gravel bed covered a 2” perforated pipe attached to a pump below the island. 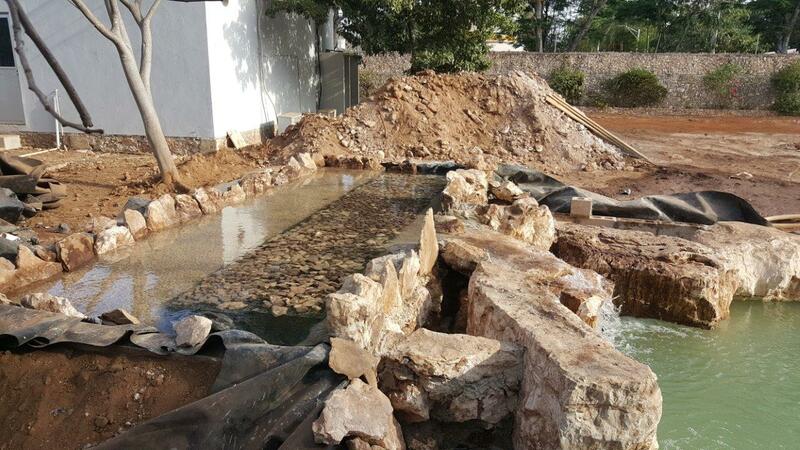 Water pumped into the gravel bed flowed back through the gravel and stones, stripped of all nutrients. 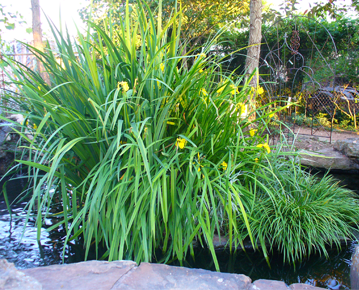 It doesn’t take much flow – usually one quarter of the volume of the pond per hour is sufficient. The size of the bog depends on the fish load. A goldfish pond where the fish are not fed at all might need a bog about 10% of the surface are of the pond in size. On the other hand, a pond where Koi are fed twice a day might need a bog 30% of the size of the pond. More elaborate bogs use EcoBlox under the gravel bed to form a sediment chamber that also traps suspended solids, but that’s the subject of another post. 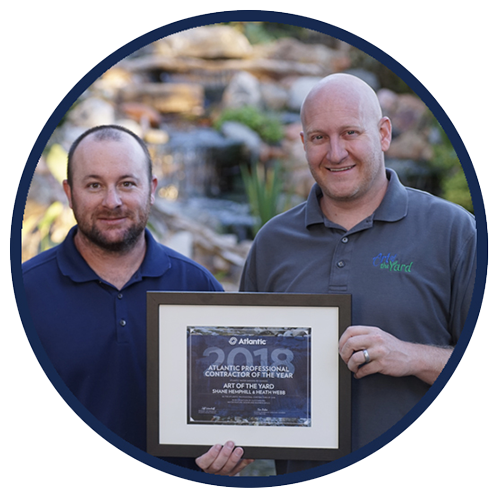 Regardless of how you choose to install them, Bog Filters keep your pond free of algae using just beautiful plants to clear and clean pond water. Pingback: My Pond Looks Great, Now What? Hi Lynda, in a market like central Florida there’s a different set of winter issues than the rest of the country. They are close to being tropical in a sense where the plants never truly die off for winter and comeback in the spring. Instead they just slow down during the winter. What most likely happened here is that the plants did a fantastic job over the last season and there was silt and debris attached to the root system which is exactly what we want to happen. As the cold snap came through the plant roots diminished in size as the weather stunted them. In a more northern climate this would continue to the point of the plants needing to be harvested (cutback) as a winter preparation. Other fall maintenance would be done at this time as well. Possible discoloration of the water happens at this time as well but usually starts to clear. The thing to remember about a bog filter is it is fantastic at scrubbing nutrients from the system but very small particulate matter it sometime has a challenge with. You could try to using a flocculent such as QuickClear from Atlantic. It will bind the tiny matter together for the filter to grab. The other possibility is you have an over load of tannins. When bacteria breaks down organic matter, leaves, roots, fish waste, etc. it can remove everything but the tannins (think leaves making tea). Sometimes brown water can simply be the left over tannin. It can be remove with the use of carbon or water changes. Any chance you would have some pics? Can i collect pea gravells from river ?